Clemco’s classic blast machines has set a standard for the blasting industry. These machines are built tough to endure real-world use and with practicality in mind. Intentionally constructed with wear-parts positioned for quick replacement, Clemco’s machine design allows for the elimination of downtime and maximization of time spent at the jobsite. On the machine, a concave head stores abrasive for loading and a conical bottom ensures smooth abrasive flow and complete emptying while the machine is in operation. Clemco’s classic blast machines are available in models ranging in size from 0.5 cu. ft. to 20 cu. ft. Machines with an abrasive capacity of 8 cu. ft. and less are available as portable models. Portable blast machines are of the same industrial quality of their stationary models, but because of the often smaller machine size and attached wheels, these sandblasters are easier to move around the blast site. Stationary models are better suited for industrial use in blast rooms or for applications requiring a large volume, yet economical, blast machine. Stationary machines may also be fixed to sites or to custom truck or trailer-mounted systems. 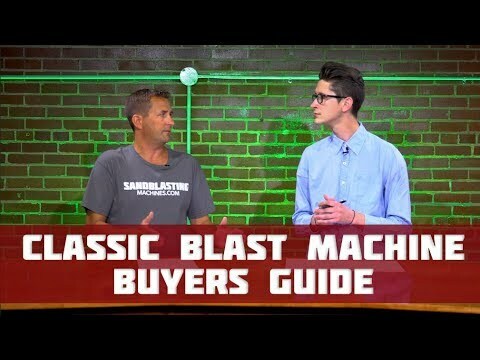 If you were looking for the contractor-style blast machine, find it here.